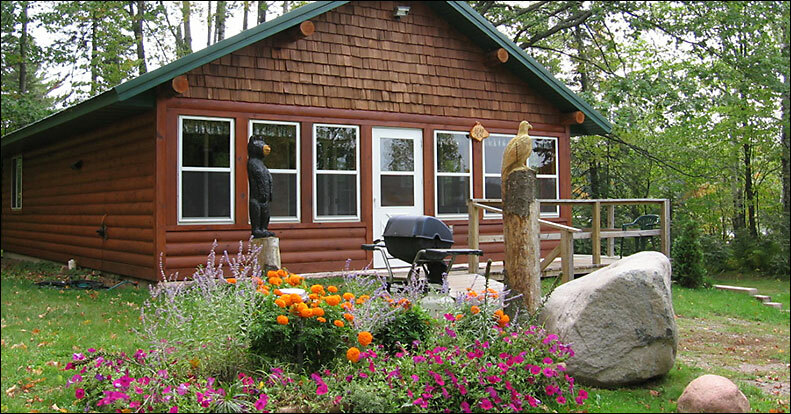 There are four beautiful cabins to rent at Mystic Moose Resort in Hayward, Wisconsin. 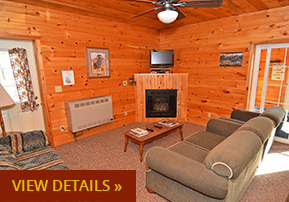 We have two older cabins at the resort that have been recently renovated and two recently constructed newer cabins. 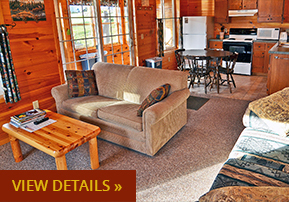 All cabins have screened porches, gas grill, and modern bathrooms with showers, satellite TV and wireless internet. All kitchens are fully equipped with microwaves, stoves and refrigerators. Ceiling fans are in all cabins. The two newly renovated cabins have new furnaces, kitchen stoves and microwaves. New cupboards were installed in the Wolf Den. A beautiful recent addition to Critter Cabin added 200 sq. feet of living area and a new bathroom. All of our kitchens are set up and fully equipped for your use. We do encourage you to bring your own bath and kitchen linens, but we do have some available if necessary. All of our beds are completely made up with sheets blankets and pillows. The resort grounds are very quiet and peaceful complete with beautiful flower gardens, swings, lawn chairs, hammocks and a kid’s play area. All our vacation cabins have wonderful screen porches for relaxing. Bonfire pit wood is supplied for the fire ring by the lakeshore. Mystic Moose Resort also has gas grills for each cabin and a fish cooker available. We have many flower gardens for you to look at. Evening star gazing is a must. Watch the beautiful bald eagles soar just clear of the tree tops. You will never experience what you see up here in the city. It’s amazing!!! You are invited to join us on Moose Lake near Hayward, Wisconsin so we can share with you, this beauty of nature. Ask about our off season discounts, September through May. 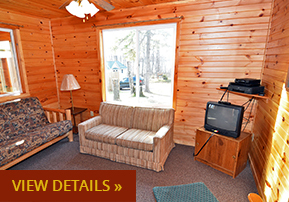 All cabins are priced for up to 4 persons. Cabins are rented on Saturday to Saturday, June-August. All other dates September-May are a 2 night minimum. If a short stay is available during the summer months it may be rented at the daily rate. Children are considered under 12 years of age. Infants are considered under 2 years of age & are free. See extra person rate if your group exceeds 4. * All prices are subject to 5.5% Sales Tax. We do accept pets of all sizes in all 4 of our cabins. Weekly or short stay pet rates are $75 per pet. Deposits of $250.00 are required per cabin on weekly rentals. $100.00 deposit is required on short term stays. CANCELLATION POLICY: 75% of your deposit can be transferred to another date (within one year) providing the change is done 60 days prior to your reserved date. VISA and MasterCard accepted. JUNE – AUG: Check in time is 3 PM and check out time is 9 AM. SEPT – MAY: You may check out later or check in earlier but please call to make arrangements. There are no refunds given for early check outs. We Accept Visa, Mastercard, & Discover credit cards. Please Note: Do not forget, Mystic Moose does not furnish bath, hand or kitchen towels, bath soap or shampoo. All bedding is furnished, along with coffee pots and filters. Note: All kitchens are fully furnished. Thank you. 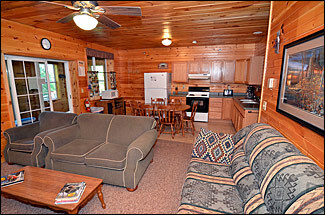 Log-type 2 bedroom cabin, living room, full kitchen, modern bath, large screened porch. Situated next to the water. 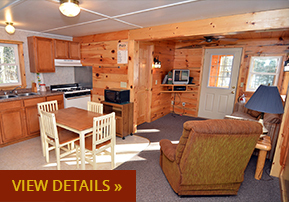 An newly redecorated, neat 2 bedroom cabin with screened porch, full kitchen and bath. Overlooking the water. Spacious 3 bedroom cabin, kitchen, living room, fireplace, large screened porch. 2 baths available for groups over 6. Overlooks entire waterfront. A very neat 2 bedroom cabin, full kitchen, living room, bath and screened porch. Set back for privacy.